Want to turn your iPad into a portable TV? 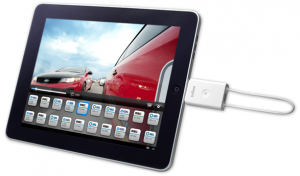 Look no further than the Tivizen Dongle for iPad. Humax currently offers you two ways to watch live TV on your iOS device. There’s the Tizi, which it has rebranded as the Tivizen, and is selling for around £100. It’s an external, battery powered TV tuner that sets itself up as a Wi-Fi hotspot which you can then use to steam TV to your iOS device via an app. However, if you’ve got an iPhone 4S or an iPad 2 or 3 you can instead opt for the Tivizen Dongle for iPad that we’re looking at here. This is a simpler and cheaper device that plugs into the dock connector on you iOS device to turn it into a portable TV. Thankfully the Tivizen Dongle for iPad (it’s also being sold as the Tizi Go with different software by some other manufacturers) is actually quite small and compact. Finished in gloss white with a small Tivizen logo stamped on the front, it measures just 30mm wide and sticks out by around 50mm from the bottom of your iPad when it’s attached to the dock connector. Unlike the Tizi, it doesn’t have a telescopic aerial, but instead just uses a loop aerial. This is simply a flexible piece of wire that loops from one side of the bottom edge of the dongle to the other. The dongle doesn’t draw power from your iPad when it’s being used as it has its own Lithium Ion 250mAh battery built-in. You charge this using the supplied USB adaptor cable that plugs into the micro USB port hidden between the two points where the loop aerial connects to the dongle. There’s also a small LED light on the top of the dongle that glows red while it’s charging and turns green once the battery is fully topped up with juice. Charging it via a normal USB port on a computer (there’s no USB charger included in the box) will take around two hours and once it’s fully charged you’ll get around nine hours of TV watching from it. Of course, to use the dongle you first need to download the Tivizen app. This is free and once it’s installed on your iPad it automatically starts up every time you plug the dongle into the bottom of your tablet. When you first run the app you’re asked to choose your country and after you’ve made your selection it scans all the available channels. This only takes a couple of minutes. On the Humax website there’s a warning that this product is only suitable for use in strong signal areas. We used it in East London near the Olympic site. This is around 17km away from the Crystal Palace transmission tower, so we reckon it falls within a strong signal area, especially as you can get pretty good reception using an indoor aerial with a normal TV. The first two times we performed the scan indoors, it failed to pick up the Freeview multiplex with the BBC channels. After this we took it outside to try scanning again and this time it did pick up the Beeb’s multiplex, but lost one of the other multiplexes. In fact during our testing we never got it to store all of the multiplexes at one time, so as a result there were always some channels missing, although these tended to be the minor ones. What was strange was that once it found the BBC multiplex outdoors, it actually got good reception for the BBC channels indoors. In fact, the reception quality for all the channels it managed to pick up was impressive, especially given it uses such a small aerial. The post Humax Tivizen Dongle for iPad appeared first on Trusted Reviews.